With their natural ability to climb trees and survey their territory from a high vantage point, cats have a need to rise above the hustle and bustle of everyday life. Climbing and scratching are two of their natural requirements that, when met with cat furniture, can keep your cat happy — and your own furniture safe. Cat furniture can be as simple as stacked empty boxes and as small as shelves and perches, either in front of a window, above a door, or stair stepping their way up the wall. A larger piece of cat furniture, though, is the cat tree, popular because it offers climbing, perching, and, in many cases, scratching opportunities. Most are multi-level; choosing the optimum number of levels “really depends on thedynamics of cats in a home,” explains Rebecca Mountain, founder of Mountain Cat Trees, whose company creates eco-friendly cat trees. “If all the cats are active and play at the same time then certainly they would benefit from a multilevel cat tree or more than one. I like the idea of more than one cat tree because cats can race from one to climb another, which promotes more activity and also makes it easier to share.” Mountain recommends looking for cat furniture created using natural materials with a minimal amount of dyes or finishes to ensure an eco-friendly product. Cat trees or smaller cat scratchers can be a place for cats to act out their natural desire to scratch and keep their claws sharp. 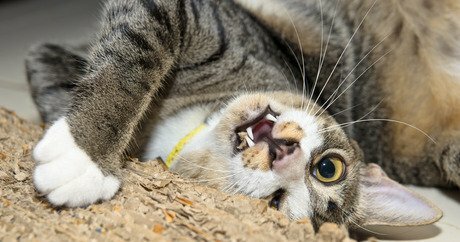 “Destruction caused by scratching is a troublesome problem, yet this behavior is a completely natural and instinctual way that cats use to keep their claws groomed,” explains Jennifer Couillez, product marketing manager at Petmate, a company that makes several types of scratchers. Scratchers come in a range of styles, from vertical posts to angled scratchers to horizontal scratchers your cat stands on. Mary James, co-founder of SurfPet.com, which sells a variety of types of cat furniture, recommends making sure a scratcher is tall enough for your particular cat. “Cats generally prefer to be able to fully stretch, so a tall post 24 to 32 inches works best. If your cats can’t stretch out far enough, or can’t get a firm grip, they may go right back to using your sofa arm as their favorite claw sharpening station.” James recommends two other features when selecting a tree: a sisal mesh fabric for its durability and cat approval factor as well as a sturdy, wide base that will not wobble. When it comes time to make your final selection of cat furniture, there’s one rule of thumb — or paw — to keep in mind: make sure the furniture doesn’t just meet your needs in terms of style, space, and price but also your cat’s needs. Your cat will be the final judge of just how successful that cat furniture will be in your home.